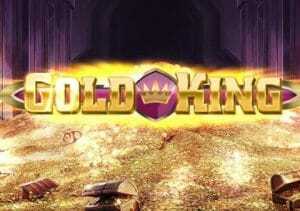 Enjoy and audience with the Gold King, a flashy and extremely volatile video slot from Play ’N Go. Played using a 5 reel, 20 payline game engine, you’ll see giants stacks of matching symbols spinning around the reels. The game also comes with a free spins round complete with super stacks and expanding symbols. Stakes range from between 20p and £100 per spin. There’s a blingy feel to the design in Gold King – the reels are set against a chamber full of gold and treasure. The lower value A to 10 symbols are edged in gold. They’re joined by gold bars, amulets and crowns. Land just 2 of these symbols to create a winner. The best of the trio is the crown which offers awards of up to 25 times your bet. On each spin, 1 standard symbol is selected at random. This spins in giants stacks that are 12 high – this is known as the Super Stack feature. There’s also a wild that substitutes for everything and pays up to 125 times your bet per payline. The main offering in Gold King is the Super Spins feature which is triggered by landing the scatter (the Gold King himself) on reels 1, 3 and 5 on the same spin – 10 free spins are awarded. 1 lower value symbol spins in 8 high stacks during the feature with the wild spinning 6 or 7 high. The feature also comes with expanding symbols – after a win featuring the A to 10 or wild symbols has been paid, any of the gold bar, amulet and crown symbols expand to fill the whole reel if it creates a new winning combination. You could also benefit from a randomly triggered Golden Spin feature – this sees reels 1, 3 and 5 filled with matching Super Stacks on that free spin. You can also retrigger the feature by getting 1, 2 or 3 scatters – there’s an unlimited amount of additional free spins up for grabs. This video slot is extremely flashy looking and the same is true of the volatility which is sky high. You won’t find many game where the variance is as high as what’s on offer here. Saying that, you can win up to 2,500 times your bet on each spin. Expect some big swings to your bankroll. There’s be losing spells aplenty but if you managed to get lucky in the Super Spins feature then the Gold King can live up to its name and deliver some potentially lavish rewards. I also recommend you take a look at other Play ‘N Go titles with Planet Fortune and Viking Runecraft 2 of their better ones.